Jumper cables come in handy and may be the only way for you to resurrect a dead battery. But what happens if you are stranded, far from home and with no one nearby to help out? Even if somebody does stop by to render assistance, you can never be quite certain that they have your best interests in mind. Well, there is a solution that may be of interest to you, especially if the thought of being without help for hours or longer has you concerned. 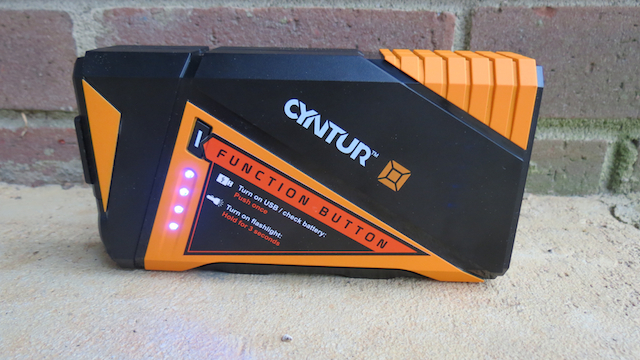 A California company by the name of Cyntur has developed the JumperPack Mini, a powerful self-contained jump-starter that can have your drained car or truck battery started again. 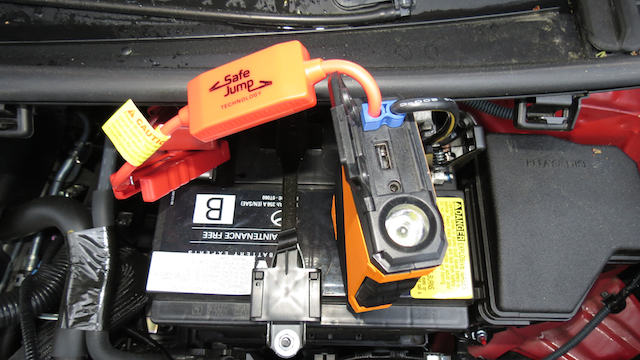 Although it is compact, the diminutive JumperPack Mini packs enough power to start a V-8 powered vehicle thanks to its powerful lithium-ion battery and connecting red and black clamps. The Cyntur JumperPack Mini sits on top of the battery waiting to recharge it. To use the JumperPack Mini you simply ensure that your ignition is turned off. Then, engage the parking brake and place the transmission in park (automatic) or neutral (manual). Next, you will place the unit on a stable, level surface as close to the battery as possible, but away from the engine and other moving parts. Notably, this unit is only 6 inches long by 3.3 inches wide by 1.3 inches high and weighs just under one pound. Next, insert the jump-start cable into the JumperPack Mini. Then, connect the red positive clamp to the red positive battery terminal. Likewise, do the same for the black negative clamp and terminal. Once the connections are firm and everything is in place, start your engine. Cyntur recommends that you crank the engine for no more than four seconds. Usually, your engine will turn over, but if it does not, then recheck the connections before attempting a second start one minute later. Once the engine has turned over, then disconnect the red clamp followed by the black clamp. Although you will likely store the unit after that singular use, you will need to recharge it as soon as you can. Certainly, you want to have enough power on hand for the next emergency. Bright LED function lights show when the Cyntur is charged. Cyntur says that the JumperPack Mini holds a charge for up to one year. The compact kit comes with an AC wall charger and will fully recharge the unit in under four hours. Therefore, check the unit before you leave for your next long trip, such as your family excursion this summer. Two disclaimers before we move on: I had no need to use the JumperPack Mini on my car as the battery is new and in excellent condition. But I will say that the instructions were easy to follow, the unit is solid and the connecting points are firm. The second disclaimer is that Cyntur supplied the JumperPack Mini for product test purposes. It is a complimentary device, but that in no way influenced my opinion about the product. Check out the other reviews on this site and you will note that we are objective in all our many analyses. Cyntur supplies a carrying case for the unit and the cable, but it does not provide enough room for the AC adapter — you will need to store that separately. The case is compact enough to fit in the majority of glove boxes, in your center storage compartment or in an under trunk compartment. It occupies less room than your bulky jumper cables — not that you want to remove those. Personally, I consider the JumperPack Mini as insurance for those times when help is NOT on the way. There are a few other considerations about the jump-starter worth mentioning. Notably, it comes with a built-in 200-lumen LED light, ideal for providing display lighting or emergency strobe lighting when you need it. Furthermore, a battery level gauge displays the available power, which is terrific — you will not be taken by surprise if there is not enough energy left. Finally, it comes with a 2.1A USB port and that means you can recharge your smartphones and tablets no matter where in the world you are. That means if you are camping remotely, you can keep your devices charged. 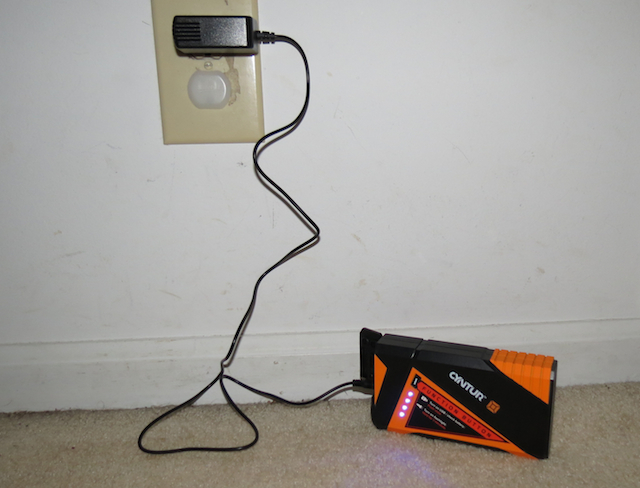 A supplied AC adapter makes recharging easy. You can order the JumperPack Mini directly from the company at www.cyntur.com. Or you can visit any Target store, the exclusive brick and mortar retailer for this unit with a retail price of $99.99. Think grad or dad gift here. So, keep in mind that I did not test this unit on my car’s battery. I did fiddle with the light, and charged my cell phone — I also understand that it can handle my wife’s tablet. Certainly, if it were to charge my laptop I would be immensely gratified, but I have no complaints as my smartphone is the biggest energy drainer of them all. You understand the importance of assembling a tool kit for your home, but do you have a tool kit for your car? With a brand new car, it is easy to overlook the need for such tools, but if you’re in an accident something as simple as duct tape or a charger for your cell phone can come in handy. Assembling a tool kit for you car includes those items that will enable you to make repairs to your automobile as well as those things that can ease your wait while help is on the way. Lets take a look at the essential tools you can keep in your car. 1. 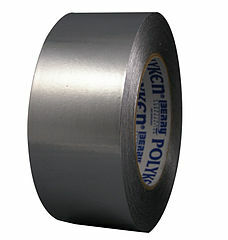 Duct tape — Useful for mending just about anything, duct tape can seal a leaking hose or reattach a light or bumper that comes dislodged from your car. Not the prettiest tool in the tool box, but perhaps one of the most essential and cost effective items your emergency kit can include. 2. Scissors — You may be able to rip the duct tape to get the pieces you need off, but a pair of long nose scissors can do the trick quickly and effectively. Scissors can be put to other uses to including cutting gauze if you are injured. 3. Multi-head screwdriver — You don’t have room to carry a set of screwdrivers in your car, but a quality multi-head screwdriver can do the trick. Look for a 10-in-1screwdriver/nut driver set that feature both Phillips and flathead screwdrivers of varying sizes along with nut drivers and torx head drivers. 4. Pliers — Both needle nose and wire cutting pliers can come in handy if your car breaks down. The needle nose plier can slip into tight spaces where your hands cant reach. 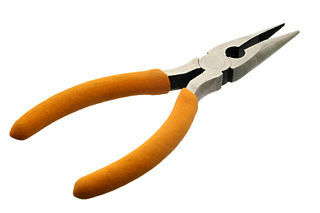 The wire cutter pliers can be useful for fixing wiring that works loose such as the connection to your personally-installed audio system. 5. Hammer — An indispensable tool to handle most any repair project, a ball peen hammer or mallet can be useful in tapping a part that has worked its way loose in your car. That old hub cap on your classic car can stay in place with some careful tapping of this hammer. 6. Work gloves — Any type of emergency project with your car requires the use of a good pair of work gloves to protect your hands. Not the cheap cotton kind that simply cover your hands, but the padded leather or synthetic leather pair that gives you a better grip of your hand tools. 7. Adjustable wrench — Look for a three-piece wrench set for your adjustable wrench. A wrench comes in handy when you need to adjust bolts that have worked loose. Gain access to that nut you otherwise wouldn’t be able to reach with a pair of pliers or a regular wrench. 8. Fire extinguisher — A car can go in flames within seconds if an oil leak is undetected and suddenly ignites. A compact extinguisher is suitable for your car, one that issues dry powder to handle a variety of fires including electrical. Your car contains a number of combustible materials including upholstery, wood products, cloth and paper. A fire blanket can come in handy too, representing a sheet of fire retardant that can cover small flame ups. 9. Bungee cords — What on earth would you use a bungee cord for? Lots of things including keeping everything secure on your roof rack and act as a map holder when affixed to your car door. Use a bungee cord to hold something in place where duct tape just wont do. 10. Flashlight with batteries — Invest in a high quality flashlight, one that is water resistant, discharges a bright light and is easy to grip. Consider a light that can be fixed from the inside of your open car hood or one that has a twistable base and can rest on your radiator or car battery. 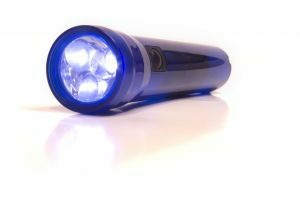 A rechargeable light can work wonders or a battery flashlight can do the trick, but bring along several backup batteries for your standard flashlight. 11. Car charger — You bring your cell phone with you wherever you go. To keep it charged, you need a quality recharger that can be hooked into your cars cigarette lighter. Look for one with a 20 amp to handle all of your recharges including your cell phone, laptop, iPhone, iPad, you name it. 12. Jumper cables — Never skimp when it comes to jumper cables. Choose heavy-duty, 4-gauge cables to provide the durability you need. Short cables wont do, choose 25-foot cables ideal for times when you don’t want to push the car out for a jump. If you drive long distances and your trip takes you through remote places, a car emergency kit is ideal too. Such kits should include drinkable water, nonperishable food, an emergency thermal blanket, beacon flares and a first aid kit. You can buy these items separately or purchase a kit containing everything that you need.